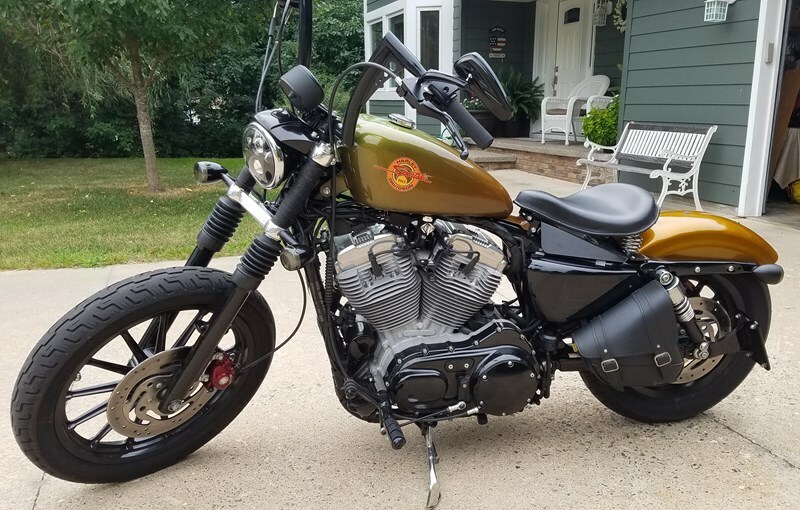 Custom gold powdercoated tank and fenders. Black powdercoated rims, front fork sleeves, clutch housing cover, derby cover, transmission cover, filter housing, red powdercoated belt sprocket and brake calipers. New parts include black mirrors, clutch and brake levers, mini ape handlebars, hand grips, forward controls, side bag, solo seat assembly, LED headlight and turn and brake signals, Python slip on mufflers with black exhaust wrap, bobbed rear fender.